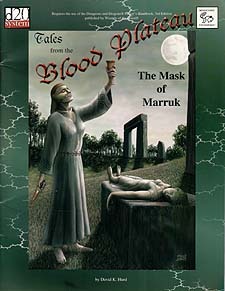 Human sacrifice, vengeful gods, hungry giants, haunted forests, and a besieged town whose history is written in blood. Just another day on the Blood Plateau. It has been two hundred years since Marruk has last been summoned and now the baron's daughter has been kidnapped. In The Mask of Marruk our heroes are asked to rescue the missing girl and in the process save the town of Fanghorn View from a catastrophe of historic proportions. All that stands in their way is a secluded giant, a cult of dark druids, and an army of savage orcs from the Blood Plateau.